Is that you, Robot Chicken? 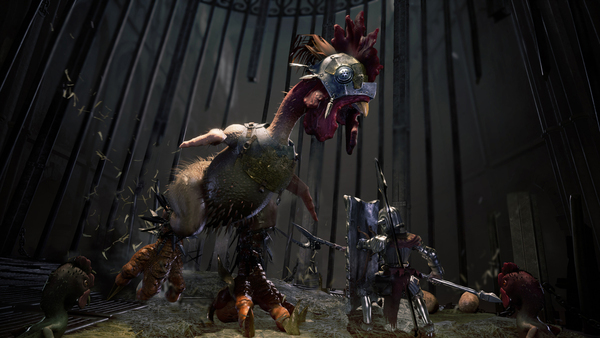 Adam’s quest for redemption continues with the addition of a new non sequitur boss to defeat - a giant armored chicken. Armed with a deadly peck and minion-spawning eggs, Cowardly Modic pits Adam against his fowl-est challenger yet. Two new weapon sets, twin swords and a sword and shield combo, add fresh options to an already powerful arsenal, each harnessing the power of conquered bosses. In addition to a new boss and weapons, three more challenges await in New Game+. The Trial of Speed grants Adam swiftness in exchange for losing invulnerability during dodge rolls, while the Trial of Consequence restricts Adam to a single life and Trial of the Sinner fuses both into the ultimate test of skill. This new content update, which has been available stateside for a bit, has finally made its way over to the Switch version in Japan. This content update is 100% free.